Within this park there’s a great playground, a skatepark and huge expanse of playing fields with football goals set up. 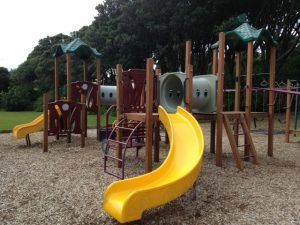 The playground can be accessed by a long slide (from Wellington Road) which is always a fun way to arrive! Otherwise the equipment is mostly one huge structure with a part of it aimed at younger kids and part at older kids.It’s worth noting that the side nearest the skatepark has some really high structures (monkey bars, climbing walls etc) so if your younger kids end up there inadvertently, they will probably require help. Even older kids that aren’t so confident with heights might need help! The section for younger kids has small slides, ladders, tunnels and a fire engine. The part for older kids has a balance beam bridge that wobbles, rock climbing walls, monkey bars, various ropes for climbing and balancing on and a wavy slide. Separate to this structure but still close by are swings and a ball shoot. Right next to the playground, within sight if you’re keeping an eye on kids on both, is the skatepark. This has ramps of different sizes and a rail. There’s a toilet (albeit with no soap or toilet paper!) which is the painted building between the skatepark and playing fields. There’s also a water fountain for drinking out of or filling bottles. Some picnic tables and benches are laid out near the playground and there are some big old trees that provide shade over some of the playground equipment at various times of day or if you want to escape the sun on a hot day. 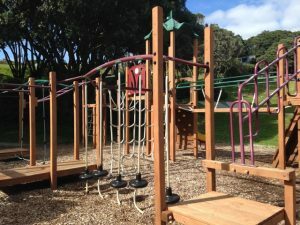 If you’re driving to this playground you might want to pick up a takeaway coffee or food at one of the outlets on Beach Road as there’s nothing within walking distance. Take a ball and scooter and you could easily spend a day at this park. Address: Campbell Park, parking on Wellington Road or Pingau Street both of which are closest to the playground and skatepark. You can also access this park from The Parade but you’ll need to walk across the large playing fields to get to the playground.